What algorithm did Microsoft use to dither colour in early versions of Windows? I am creating a retro-themed game and am seeking to reproduce this same dithering appearance Microsoft used in early versions of Windows. However, I cannot find any information/documentation on the algorithm or method they used to achieve this unique look. My end goal is to create a function that accepts RGB components, a box area size, and N solid colours...and outputs a pattern creating a new dithered colour appearing as Windows 3.x would display it. My question is, what algorithm did they use to combine Red, Green, and Blue components into these dithered patterns, all while assuming a base of N solid colours (in this case, the 16 standard VGA colours)? 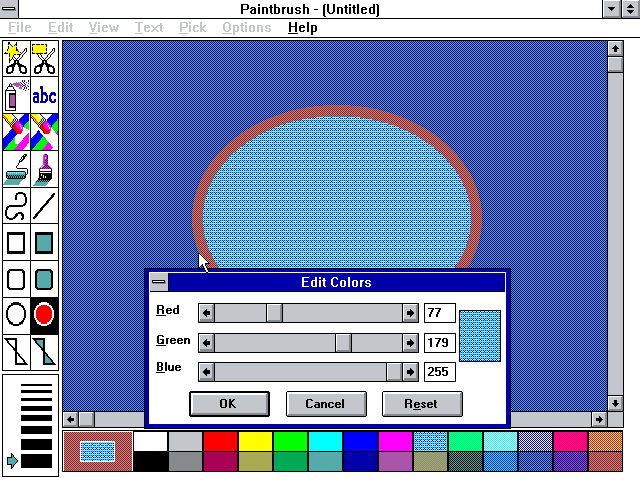 Basically, Windows used the basic 16-color CGA palette, which included 4 shades of monochrome, and 12 basic colors (two each of red, green, blue, yellow, purple, and teal), which later formed the basis of the "web safe palette" that became popular during the early days of the Internet. The algorithm used back then was known as the Bayer dithering technique, otherwise referred to as ordered dithering. The basic idea was to generate a grid of threshold values in a mathematical arrangement that favors nearly consistent values equal distances from each other, which is what produces the cross-hatch effect. Basically, the entire thing was dreamed up by Bayer, and this algorithm dominated the market during the 4-bit era of computer graphics. You can read more about ordered dithering from DITHER.TXT, which basically explains different algorithms and sample implementations. Always dither from a full-color image, otherwise it'll probably look even worse than you intended. Dithering in realtime is trivial for modern systems, as even classic 33mhz systems that ran Windows had no trouble implementing the Bayer dithering pattern. As @phyrfox mentions, it is ordered dithering using a bayer matrix. As I recall, the Windows code did have some special cases. If you asked for #C0C0C0 you would of course get solid #C0C0C0. This was a special case; if you asked for #BFBFBF then you would get a chequerboard dither using #808080 and #FFFFFF. The dither used an 8×8 matrix, so it would only approximate 18-bit colour. If at least one channel had a value of greater than #80 then it would dither using a palette of the seven bright colours, plus #808080 and #000000. Not the answer you're looking for? Browse other questions tagged windows31 dithering or ask your own question. Why did Windows pick 260 characters as the maximum path length?